Private and public expenditures on non-residential construction and machinery and equipment are anticipated to rise 0.8% to $238.7 billion in 2018, following a 3.0% increase in 2017. An anticipated $2.8 billion increase in capital spending on machinery and equipment (+3.5% to $83.4 billion) leads the way, while capital construction spending is expected to decline 0.6% to $155.3 billion. Capital expenditures in the public administration sector are expected to increase 6.5% to $32.4 billion in 2018, due to higher non-residential construction (+5.9%) and machinery and equipment (+9.2%) investment intentions. Total capital expenditures are anticipated to increase across all levels of public administration (federal, provincial and territorial and local, municipal and regional). Capital spending in the oil and gas extraction subsector is expected to continue its contraction with a fourth consecutive annual decline in 2018. Spending in the sector is expected to decrease 12% to $33.2 billion, mainly attributable to the non-conventional oil extraction industry, where spending is expected to decline by one-fifth to $10.2 billion. Meanwhile, spending in the conventional oil and gas extraction industry is projected to decline 7.0% to $23.0 billion. The largest decline in spending in the oil and gas extraction subsector is anticipated in Alberta (-12% to $22.5 billion). There were also decreases in Newfoundland and Labrador (-31% to $1.7 billion), British Columbia (-8.7% to $4.6 billion) and Saskatchewan (-0.8% to $3.9 billion). Capital spending in the real estate and rental and leasing sector is projected to rise by 9.9% to $14.1 billion in 2018, mainly due to increases in Quebec and Ontario. Firms within the manufacturing sector expect to increase capital spending by 6.2% to $16.0 billion in 2018, led by higher spending in Alberta by petroleum and coal product (+$327 million to $601 million) and chemical manufacturing (+$298 million to $693 million) firms. Total capital expenditures in the transportation and warehousing sector are expected to increase by 1.4% to $30.6 billion. Additional spending in the transit and ground passenger subsector (+11% to $8.5 billion) is expected to more than offset declines in the pipeline transportation subsector, down 9.8% to $7.4 billion in 2018. Private and public capital expenditures in non-residential construction and machinery and equipment are anticipated to increase in five provinces and two territories in 2018. Widespread spending increases in Ontario (+7.8% to $73.9 billion) lead the way, with notable anticipated increases in the utilities, public administration and educational services sectors. Spending in Quebec is expected to rise 5.1% to $37.7 billion in 2018, a fourth consecutive annual increase. The real estate rental and leasing, public administration and mining, quarrying and oil and gas extraction sectors are the main contributors to growth. However, spending in the utilities sector (-12.5%) is expected to fall sharply. In British Columbia, capital spending is anticipated to rise by 1.2% to $32.2 billion in 2018, following a 21% gain in 2017. Declines in the mining, quarrying and oil and gas extraction and educational services sectors are more than offset by increases across many other sectors, notably in utilities, manufacturing and real estate and rental and leasing. In contrast to these expansions, Alberta (-$3.0 billion to $54.1 billion) and Newfoundland and Labrador (-$2.4 billion to $6.2 billion) are anticipating the largest declines in capital spending. Lower spending in the oil and gas extraction subsector as well as the utilities sector are major contributors to the declines in both provinces. In Alberta, there are also notable declines in the educational services and the transportation and warehousing sectors. Preliminary estimates show that private and public capital expenditures in non-residential construction and machinery and equipment rose 3.0% to $236.8 billion in 2017, following an 8.5% decline in 2016. Widespread spending increases in most provinces and territories in the public administration (+$4.2 billion to $30.4 billion), educational services (+$1.8 billion to $11.3 billion) and utilities (+$1.4 billion to $32.2 billion) sectors led the way. Increased investment in the transportation and warehousing sector (+$2.4 billion to $30.2 billion), notably in Ontario and British Columbia, also helped to reverse the decline in 2016. In the mining, quarrying and oil and gas extraction sector (-$1.2 billion to $47.0 billion), lower capital investment in non-conventional oil extraction and non-metallic mineral mining and quarrying outweighed gains in capital spending on conventional oil and gas extraction. Capital spending in the manufacturing sector fell 8.9% to $15.0 billion in 2017. Capital spending was up in seven provinces and two territories, led by British Columbia (+21% to $31.9 billion) and Ontario (+6.5% to $68.5 billion). Alberta reported the largest decline (-6.0% to $57.2 billion). Revised estimates for 2016 show that private and public expenditures on non-residential tangible capital assets were down 8.5%, following a 7.6% decline in 2015. The declines in both 2015 and 2016 occurred against the backdrop of significantly lower oil prices, particularly for West Texas Intermediate, compared with the 2010 to 2014 period. Total expenditures on engineering construction assets declined 12% in 2016, led by oil and gas engineering construction, which fell by 25% (or $14.5 billion) to $44.6 billion. Overall, capital spending was down in four of nine engineering construction asset categories in 2016. Excluding oil and gas engineering construction, expenditures on engineering construction would have increased 0.4%. This category has been the main contributor to every annual increase or decrease in capital spending on engineering construction since 2008. 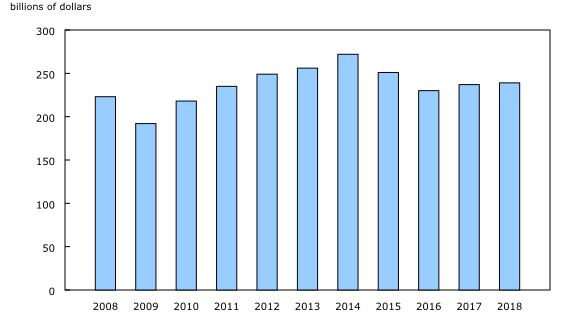 Capital expenditures on non-residential building construction declined 8.9% in 2016, following a 6.3% increase in 2015, which was the first annual advance since 2012. Spending on machinery and equipment (-3.5%) declined for the second consecutive year and for the fourth time in five years. The decline was led by Alberta, where expenditures were down 13% in 2016 and were 37% lower compared with 2014, just prior to the downturn in oil prices. Capital spending on software increased 19% in 2016 to $10.6 billion. Spending was up in seven provinces and two territories. Ontario led the way, with expenditures rising by $1.0 billion (+24%) from 2015 to $5.4 billion, accounting for over half of all spending in Canada in 2016. There were also notable increases in British Columbia (+35% to $1.2 billion), Alberta (+18% to $1.4 billion) and Quebec (+11% to $1.8 billion). Saskatchewan (-20% to $200 million) recorded the largest drop. Expenditures on exploratory drilling for oil and gas fell 31% or by $816 million in 2016 following a 40% decline in 2015. Spending on geological, geophysical, and other exploration and evaluation costs for oil and gas (-32% to $580 million) and mineral exploration (-14% to $1.6 billion) also declined. The Capital and Repair Expenditures Survey is based on a sample survey of 25,000 private and public organizations. The preliminary estimates for 2017 and intentions for 2018 survey was conducted from September 2017 to January 2018. In the coming months, the analytical paper "Capital Expenditures in the Manufacturing Sector — New tangible asset additions versus upgrades or retrofit," will be released. For analytical information, or to enquire about the concepts, methods or data quality of this release, contact Debra Roberts (613-951-8360; debra.roberts@canada.ca), Investment, Science and Technology Division.